The global renewable energy sector is experiencing unprecedented growth due to enhanced policy efforts by governments worldwide and sharp reductions in the cost of wind and solar power generation. 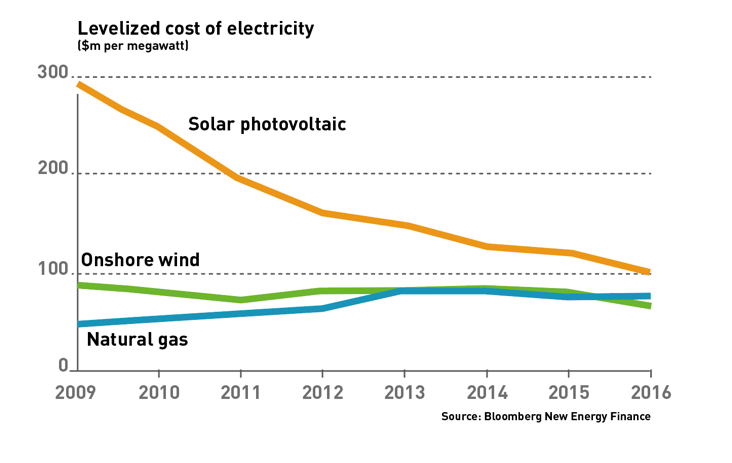 For example, the cost of building utility-scale solar power plants has fallen by 50% in the past five years. The International Energy Agency projects that renewables will remain the fastest-growing source of electricity generation, with their share growing to 28% in 2021 from 23% in 2015. Electricity generated by wind and solar varies throughout the day, depending on local resource conditions. These fluctuations mean that balancing is required in the system in order for electricity generation to meet consumption on a consistent basis. Energy storage provides fast-responding balancing to the grid, improving frequency and voltage, meeting peak demand spikes, and firming wind and solar output. The vanadium flow battery, also known as the vanadium redox battery is a grid-scale storage technology that is ideal for supporting the growth in renewables. VRB Energy is a China-based, industry-leading vanadium-redox-battery (VRB®) technology developer and manufacturer that is 82% owned by HPX (an I-Pulse subsidiary). VRB Energy has the most advanced flow battery technology in the world – its proprietary low-cost ion-exchange membrane, long-life electrolyte formulation and innovative flow cell design set it apart from other vanadium battery providers. Flow batteries store energy in liquid electrolyte, which is held in tanks external to the cell stacks that contain the cathode (positive) and anode (negative) sides of the battery. When charging or discharging the battery, electrolyte is circulated across a membrane and electrons are added into or drawn out of the electrolyte. Unlike other types of batteries, vanadium flow batteries use the same electrolyte solution on both the positive and negative sides of the battery, yielding a nearly infinitely repeatable chemical process. While lithium-based batteries are well suited to consumer electronics and electric vehicles, their lifetimes can be limited. VRB Energy’s VRB® technology can be fully drained over an almost unlimited number of charge and discharge cycles without wearing out. This is an important factor when matching the daily demands of utility-scale solar and wind power generation. Available with customized power ratings from 10 kilowatts to over 100 megawatts, and scalable energy capacity from four to eight hours or more by adding additional electrolyte. VRB Energy’s proprietary all-vanadium electrolyte does not degrade, resulting in more than 20 years of life and lower lifecycle costs. At the end of 20 or more years of successful project lifetime, the electrolyte can be reused in another battery, or recycled, and the other components can be recycled. VRB Energy’s VRB® contains no heavy metals such as lead, nickel, zinc or cadmium. The liquid electrolyte is non-toxic, non-flammable and is 100% reusable. China State Grid's Zhangbei demonstration site – The largest flow battery for the largest utility in the world. VRB Energy has completed the rigorous acceptance testing and approval process administered by State Grid Corporation of China, the world’s largest electric utility company. The eight megawatt-hour battery installed at State Grid’s cutting-edge 500-megawatt solar-wind-storage project in Zhangbei met or exceeded all of the performance test requirements for renewable smoothing, frequency regulation, peak shifting and microgrid support. The system achieved 100% availability during the rigorous 240-hour acceptance test, and has since demonstrated over two years of reliable performance. HPX and VRB Energy are working on a number of vanadium mining opportunities. Combining ultra-pure vanadium resources with VRB Energy’s proprietary electrolyte processing will allow us to drive down the cost of manufacture of vanadium flow batteries and provide competitively priced and reliable storage solutions in this extremely high-growth sector.